Enhancing Teacher EffectivenessThrough NeverBore Trainings. 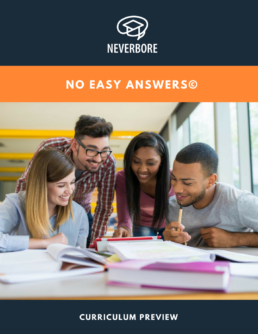 NeverBore offers a variety of hands-on trainings and workshops to schools, professional teacher organizations, and nonprofits. These professional development opportunities can be customized to fit your organization’s specific needs within 1-day, 2-day or 3-day formats. 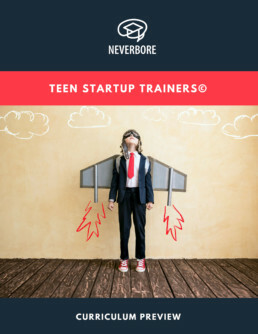 Several trainings are curriculum specific — for example, NeverBore will train teachers in best practices for implementing our Teen Startup Trainers (Entrepreneurship) or No Easy Answers (Personal Finance) curriculum. NeverBore also offers a signature Six Strategies training, which immerses teachers in all six of the high-engagement strategies described in the book, Beat Boredom. This training is interdisciplinary and designed to help teachers in professional learning teams design and implement their own high-engagement lessons. Our brains are wired to learn through stories and narrative. Students build “sticky” factual knowledge via argument. Immersing students in thoughtful role-playing scenarios. Give students messy, real-world problems to solve with creative solutions. Sophisticated academic competitions engage and purposeful activities. Getting student outside the classroom and immersed in experiences. What Does a NeverBore Training Look Like? We begin by discussing one story we tell about ourselves — and what it says about us. Do we see talk about ourselves as a hero? A victim? Is our story funny? Inspirational? We introduce the idea of “defining moments” in our lives, then read a selection from Alexie’s Absolutely True Diary of a Part-Time Indian. We discuss why Alexie tells this particular story about himself, then discuss how this can be used as a model in English/Language Arts class. We review academic research and student feedback on the value of storytelling within classroom settings. We examine how storytelling can engage students in mathematics, using a Mathalicious lesson plan on growth rates. We examine how storytelling can engage students in history, using an excerpt from the Slave Narratives and Sullivan Ballou’s letter to his wife. We debrief storytelling as a strategy, and participants have time to work in their learning teams on their own storytelling-focused lesson.